One of the five key principles of light travel is to wash clothing along the way. This allows the traveler to wear clothing items more than once, reducing the number of garments that are packed. There are several methods of doing laundry. Some people send their laundry out, while others stop at a laundromat. I prefer to do sink washing. I usually do this in the late afternoon after I’ve arrived at my destination. This gives lots of time for the garments to dry. I’ve listed my method in the steps below. Please note that there are a few extra steps using this method. They practically guarantee that the garment will be dry and wrinkle free by morning. 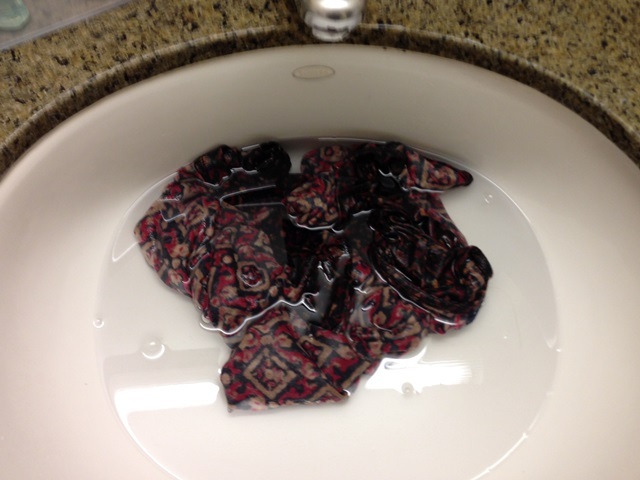 Step 1 – Launder your clothing using your soap of choice. I like to use powered laundry detergent that I keep in a small zip-lock. Others prefer packets of Woolite, bar soap, or even shampoo. Let the clothing soak for a few minutes to loosen the dirt. Step 2 – Perform an initial rinse. This will get rid of most of the soap. 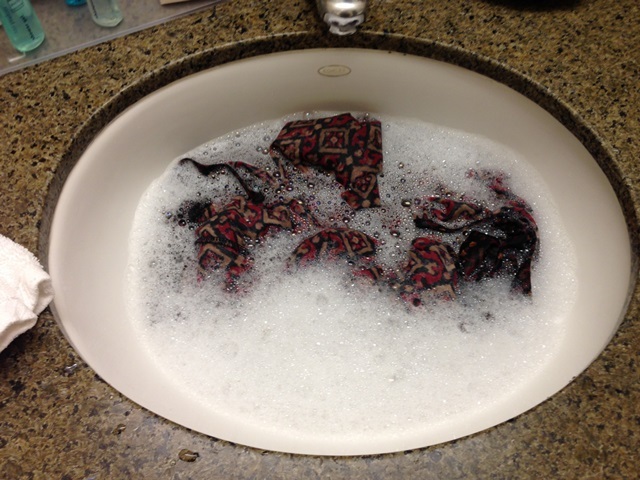 Step 3 – Let the garment soak a bit to get rid of every last bit of soap. Soap is sticky and will attract dirt if you don’t rinse all of it out of the garment. 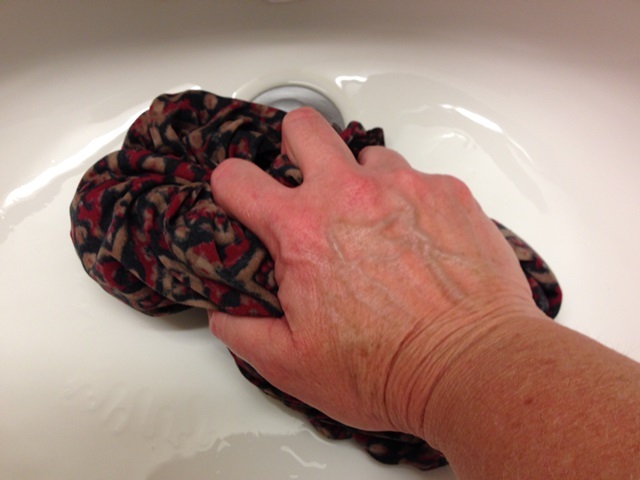 Step 4 – Squeeze as much water as possible out of the garment. 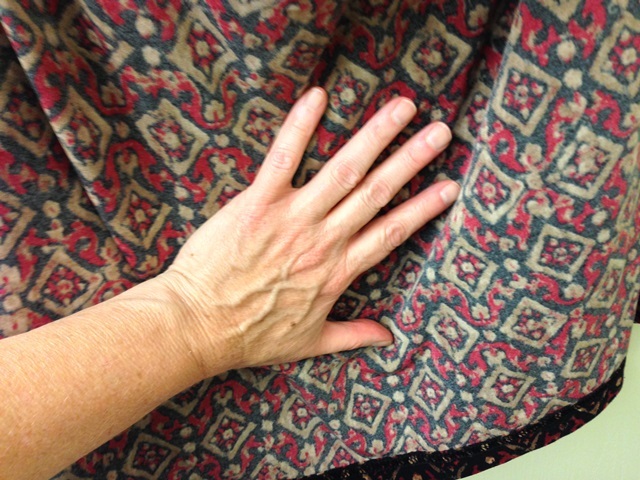 Do not wring the garment out – this will stretch the fabric and cause the garment to lose shape. 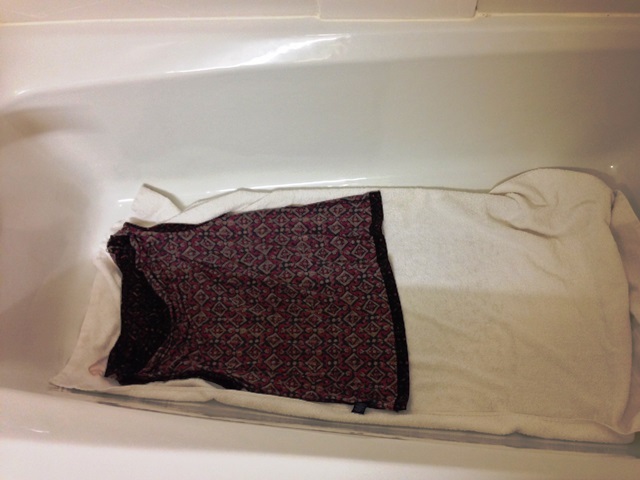 Step 5 – Find a clean place to lay the garment out on a large towel. A large counter top works, or in this case – the bath tub. Place smaller garments, such as underwear and socks, on the towel together. Step 6 – Fold the towel over the garment. 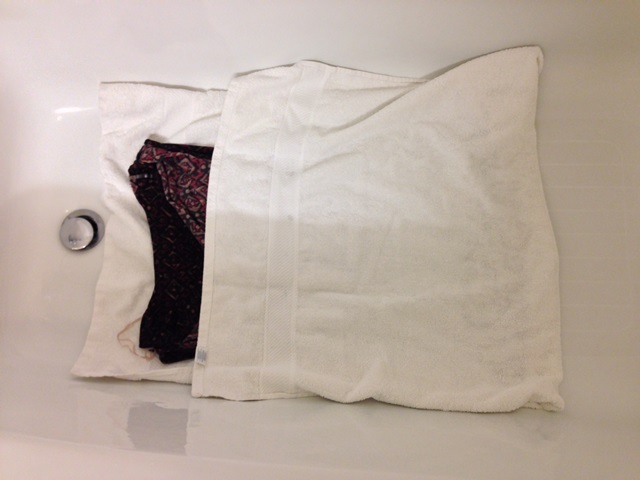 Step 7 – Roll the garment up in the towel to squeeze out excess water. 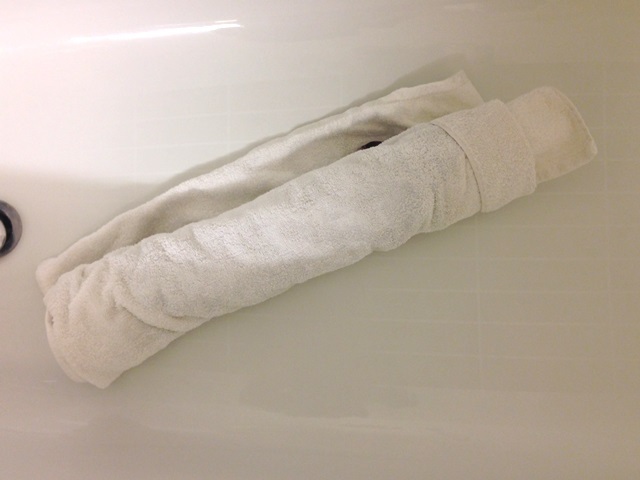 Step 8 – Fold the rolled up towel in half, placing pressure on it. The goal is to squeeze out as much water as possible. Step 9 – At this point, the garment has most of the water squeezed out of it. Hang the garment up where it can dry. Inflatable hangers spread the front and back of this shirt apart, allowing air to circulate for faster drying times. Smaller garments are hung up to dry using a travel clothes line. 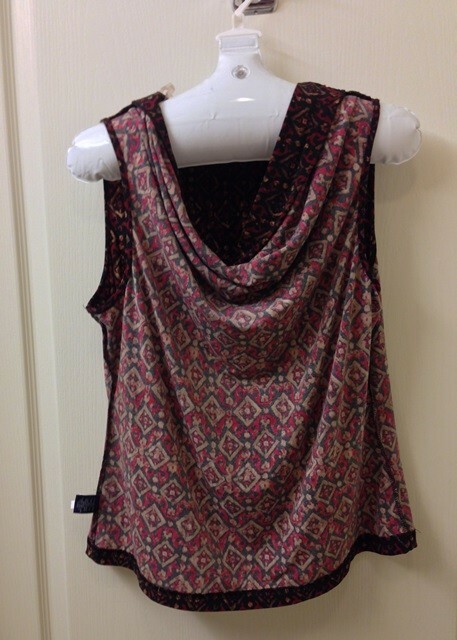 Step 10 – Smooth out any wrinkles in the garment. As the garment dries, the fibers in the fabric will shrink a bit, pulling the threads tighter. This will get rid of most, if not all, of the wrinkles. 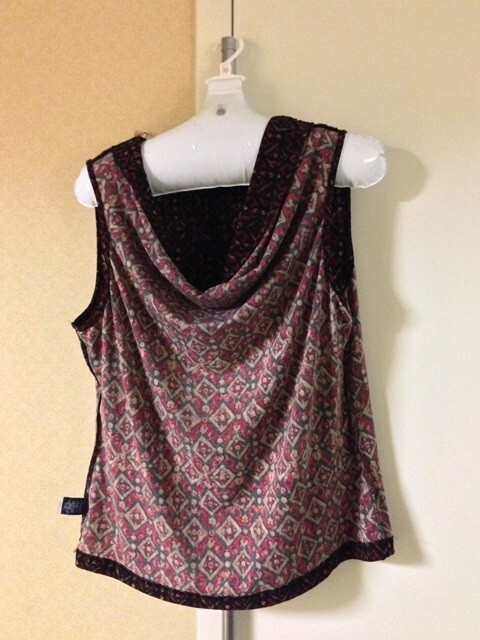 Step 11 – Once the garment has stopped dripping, hang it up in a place that has good air circulation. In this case, I’ve hung the shirt up on a hinge in the main part of the hotel room. My next post is about the gear I use when I do laundry. Not absolutely necessary but it sure speeds up the drying times. I like the idea of the inflatable hangars and the towel squeezing tip. O.K. I’m ready to GO! The towel squeezing is a critical step if you want your garments dry by morning! The towel trick looks like a good one. A couple of times I’ve had to resort to hand washing at home because the washing machine has broken, and I’ve always had trouble actually getting them to dry! Welcome back and thanks for the tip. This is excellent advice! I’ve never seen blow up hangers… perfect!!! I bought mine off the internet. They fold up very small. I actually keep them in the side pocket of my toiletry kit. I’ve also found that they work well as spare hangers when staying at smaller hotels. They never have enough hangers – especially if you have a room mate! I also carry a light plastic skirt hanger – that works well for drying pants and skirts. If you can’t find a suitable basin (some hotel sinks will not hold water, even with one of those clever travel drain stoppers), a gallon ziplock bag works well. Warm water, a little soap. the garment, shake it up well, then rinse. Instead of squeezing the towel, it’s easier and probably more effective to just lay the rolled up towel on the floor and stomp on it with your feet. Your full body weight will exert more force than your hands can, and squeeze out more water. If you don’t have a large ziplock bag handy (for use as a temporary sink), just use a supermarket plastic bag. You will eventually buy something at a supermarket, so just keep the bag. Very handy. You could certainly stomp it, but bathroom floors aren’t exactly the cleanest. Squeezing the towel gets enough of the water out without getting the towel really dirty. That means I can use the towel for other items. That’s true. I only stomp it when I use the hotel’s towel, and since they usually provide 2, I use the other (clean) one for other uses. If I had to use my own towel, I would probably hand squeeze it too. Good ideas however I have run into cheaper B&B’s and hotels where there are very few towels. If you only have one towel per person, then this option really won’t work very well. That’s why I carry a travel towel as part of my regular travel gear. It can handle multiple washing a just fine. In a pinch, you could use eucalan soap which does not require rinsing. Have you ever tried that Dr Bronners soap for washing clothes? I bought some for a camping trip and some bloggers have said it works for clothes. Also thought it was cool to see the clothesline up. Makes the nightly clothes washing seem more possible. This is awesome advice!! I will be using this without a doubt! 1) I take a small amount of powdered HE laundry soap in a Ziploc bag. The High Efficiency type, for front load washers, is low-sudsing, and easier to rinse out. Having said that, I will often use the hotel’s shampoo, as they replace that daily. 2) An inflatable hanger can do double-duty, as it makes a very good lumbar roll! I detached the plastic hook part, and you can adjust the inflation amount. Worked great when I needed it. 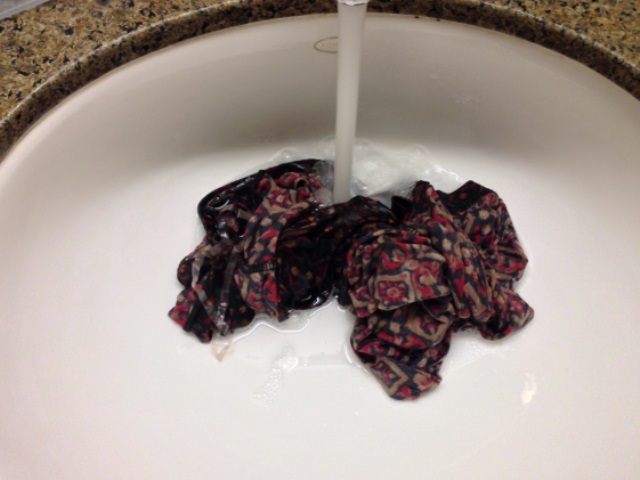 I do sink washing also, but use the hotel’s give-away soap or shampoo for clothes. An added shortcut is wash the clothes with u in the shower. Squeeze out excess water while still in the shower & drop the clothes onto the clean bathmat. Perfect for the roll up! I also travel with a clothesline with hooks at the ends.& a few little bungees for extending the line across furniture if necessary! Bobby pins and hair clips double for clothes pins. If you’re in a location that has potential for wind or your clothes to go bye bye off a terrace or balcony, string your rope through arm and leg holes. Baby powder shook into your clothes while wearing will freshen clothes and you and it’s good to prevent heat rash when it’s really scorching. We just traveled for two months with one suitcase. I think one of the most important things is to test wash your clothes (at home) to make CERTAIN they will dry in one night. If not, leave them home…. It’s too hard to coax something to dry without smelling musty after a few days. We went from rain in France to beautiful sun in Greece. Mailed home our sweaters and one pair (I took two) of my long pants. Used long pants for evenings out when I wanted to look more formal. Washed my littles every night (undies) and washed shirts every 3 days or so. The only thing I would change is to take a glittery evening blouse for fancy dinners out. I had great scarves and a couple sparkly necklaces but wished I had something fancier a few times… Can hardly wait to go again…. Happy Travels, Everyone!